It is a pleasant afternoon in a private club in Westminster and Guy Bellingfield (Amani Zardoe) has popped in to have a word with his Godfather, Jeremy (Sarah Thom) an MP and former member of the exclusive Oxford Dining Society, the ‘Riot Club’. Jeremy is worried that the club is about to have one of its dinners and he want his godson to ensure that no word of the dinner gets out into the press and causes another scandal. This means the club needs to desist from its usual riotous behaviour when dining. Guy assures his godfather that all will be well and that he is currently seeking election as the club’s president. Come the night of the dinner and Chris the Landlord of a small country pub has worked with his Daughter Rachel (Toni Peach) to prepare the private dining room for his 10 guests. Although Chris doesn’t know who the guests really are, it is obvious just from their clothes – tailcoat, white waistcoats and matching blue cravats – they are ‘gentlemen’ from privileged backgrounds. Along with Guy, the party consists of Alistair Ryle (Serena Jennings), Harry Villiers (Alice Brittain), Dimitri Mitropoulos (Cassie Bradley), Miles Richards (Jessica Siân), Hugo Fraser-Tyrwhitt (Lucy Aarden), George Balfour (Macy Nyman), Ed Montgomery (Verity Kirk), not forgetting, in the doghouse member Toby Maitland (Molly Hanson) and Club President, James Leighton-Masters (Gabby Wong). As the meal starts, the rituals of the club begin and the drinking with it. Will James be able to keep his club in order? Will Guy’s specially chosen bespoke dinner have the desired effect of making him presidential material, or will the reputation of the club rise once more overtaking any desires to avoid an unfortunate incident? The more astute of you will have noticed that in the synopsis above, all but one of the character names are male and all the actors’ names are female. Yes, this production of Posh is all female with not a man to be seen on stage. However, there has been no change to the text of the play itself so male names and male gender pronouns are used throughout as are references – of which there are many – to male genitalia and what is done with them. However, don’t get the idea that the stage is populated with eleven ‘drag kings’ using deep voices and slick backed hair and all feminine curves removed to portray the characters. No, this version of Posh is simply eleven very feminine women playing the parts of men. This was a bold decision and it works superbly. It’s amazing how quickly you forget the gender of the actor and only think about the character portrayed on stage. Part of this is due to the writing by Lucy Wade which is absolutely gripping from the opening scene in the gentleman’s club to the closing scene in the same club a few weeks later. It is witty, urbane and dark sometimes with a small amount of dialogue giving the audience an awful lot of information. With a character list of fourteen, it could be difficult to establish everyone’s identity but, in fact, Laura manages to make each character a recognisable individual in their own right. Turning to the actors and full praise to the amazing cast that have been assembled to bring the story to life. There were some stand out performances all the way through but, for me, Serena Jennings as Alistair Ryle was absolute perfection. Alistair has a rant at the end of Act I which is all about privilege and class and the fact the working classes not only don’t understand what it is to be part of the elite but should be grateful for their position in life. Every element of that speech is socially wrong but I found myself hanging onto every word and even sympathising slightly with the plight of those destined to rule us one day. Full credit to Director Cressida Carré for the staging, using the Pleasance Theatre’s ‘Revolve’ to literally keep the dinner moving and ensure everyone is noticed. I also thought the scene – time – changes worked well and the final wrecking scene was beautifully staged – you don’t have to totally destroy the set to understand what has happened at the restaurant. All in all, Posh works as a great dramatic piece of theatre. The experiment of having an all-female cast is daring and dramatic and goes to show that good, well-written characters can be played by talented actors irrespective of gender. At around three hours, including interval, it’s possibly slightly long but the story moves along at a good pace and, although obviously written from a certain angle, there is enough leeway in the script to enable the audience to make their own minds up about these rich upper-class boys and their night out. As I left, I felt as if I had been allowed to have a glimpse into a privileged world that those in the know will deny ever exists, as they control every aspect of our lives. Darkly comic, and disgracefully entertaining, Laura Wade’s universally acclaimed play Posh, premiered at the Royal Court in 2010 before transferring to the West End. Receiving a fanfare of plaudits, Posh became a huge hit with critics and audience alike. 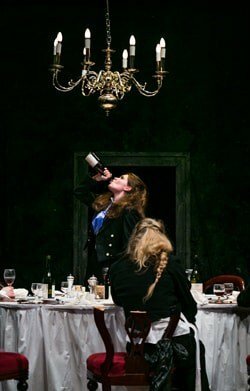 Now the riotous story of the Oxford student dining club, a fictionalised version of the infamous Bullingdon Club, will be reinvented for the first time by a company of all-female actors. In the private dining room of a gastro pub, 10 young bloods with cut-glass vowels and deep pockets are meeting, intent on restoring their right to rule. As members of an elite student dining society, they’re bunkering down for a wild night of debauchery, decadence and bloody good wine. But this isn’t just a jolly: they’re planning a revolution. This thrilling new production gives Laura Wade’s play a new, topical voice by allowing women to take centre stage in roles originally written for men. The all-female production of Posh is directed by Off West End award winner Cressida Carré.